Andrew Wilson, Professor of Ukrainian Studies at UCL SSEES, analyses the recent elections in Belarus. There were no real surprises in the presidential election held in Belarus on Sunday 11 October, with Alyaksandr Lukashenka claiming his fifth term since first assuming the presidency in 1994. Lukashenka’s official vote was a record 84 percent (compared to his modest 79.6 percent at the last election in 2010). Though according to the only real Belarusian poll agency IISEPS, only 46 percent of planned voters indicated that they would definitely vote for Lukashenka in September. As always, the elections were fixed in advance in three ways: mass early voting by ‘controlled populations’ like students, who are under strong pressure to vote a certain way (36 percent voted early); by a non-transparent counting process; and by controlling who can actually stand (see below). Belarusian presidential election banner. Wikimedia commons/Homoatrox. But the election took place in a highly volatile environment, and standard political assumptions for both Belarus and its neighbourhood are fast becoming untenable. Traditionally, Belarus was understood as the “last dictatorship in Europe”, and was therefore under sanctions from the EU and US. Belarus was Russia’s closest ideological and security ally, and was propped up by massive Russian subsidies amounting at times to 20 percent of GDP. Lukashenka used these subsidies to maintain a neo-Soviet social and economic system in which considerable effort was made to raise welfare and living standards. However, much of this may be about to change. First, because the shockwaves from Ukraine raise the possibility of a Belarusian de-coupling from Russia, which, however limited it will be, is bound to create further regional tensions. Second, Belarus is facing serious economic troubles. Third, and in many ways this is the biggest challenge for Lukashenka, is the difficultly of managing a Belarusian future with fewer subsidies and less to spend on upholding the country’s traditional “social contract”. A Belarus without populism would be as big a change as a more independent Belarus. Lukashenka is above all a statist who understands the survival of the state and his personal survival are one and the same. He has therefore been surprisingly critical of Russia’s actions in Ukraine, given the fear that similar moves could be made to undermine Belarusian sovereignty. Belarus is not Ukraine, and Russia may not use techniques of “hybrid war” or threaten to “protect” ethnic Russians or Russian language rights. Belarus is a hard security state, but culturally it is an open door to Russia, and Lukashenka’s support may be instrumental or skin-deep, especially if his social contract starts to fray. Lukashenka has therefore resisted Putin’s attempts to enlist him as a second front to pressure Ukraine. Lukashenka hosted the “Minsk Agreements” in something close to a neutral fashion, and he has taken security measures to defend Belarus against the appearance of “little green men”. His election slogan this year is “For the Future of Independent Belarus” – a sharp contrast to the 2010 iteration, which was “For a Prosperous and Strong Belarus”. Though the limits of Lukashenka’s political manoeuvring were exposed through his difficulties in resisting Russian pressure to open a new airbase in Belarus in September (though the proposed site was almost as close to, and possibly more of a problem for, the Baltic States than Ukraine). Unlike with previous concessions made to Russia, it was unclear what Lukashenka received from this bargain apart from a possible loan from the Eurasian Stabilisation and Growth Fund. Significantly, Lukashenka has made these moves despite being somewhat out-of-step with public opinion. Over 90 percent of Belarusians watch Russian TV and 60 percent of the traditionally Russophile population supports Russia’s actions in Ukraine. Popular opinion on foreign policy was perhaps surprisingly balanced before the Ukraine crisis, but in the last year support for the EU has dropped to around 25 percent, while in Ukraine, according to Pew Research Center, it has gone up to 67 percent. It will be interesting to see if state propaganda on Belarusian TV and other media can shift public opinion in a more “statist” direction. In previous elections, Lukashenka has manufactured an economic boom (leading to economic over-heating afterwards). 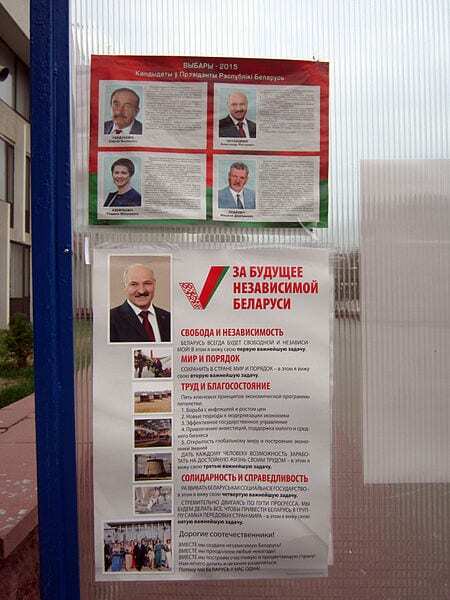 Elections have always mattered for legitimacy, not because voters have a real democratic choice, but because instrumentally – they show how batka (“father”, Lukashenka’s nickname) cared for his people. This time the situation was different because the economy is in the doldrums. Belarus has been hit hard by Russia’s recession and declining Russian subsidies. Russia is still its biggest export market, and exports to Russia are down 40 percent. Declining world energy prices are also bad news for Belarus. Cheap gas and oil from Russia was traditionally the biggest single subsidy, and bizarrely Belarus is one of the world’s top ten oil exporters thanks to Soviet-era refineries that process cheap Russian crude. However, even oil revenues are down sharply. Foreign exchange reserves have shrunk to a perilously low $4.6 billion and GDP shrunk by 3.3 percent in the first half of 2015, after a disappointing 1.5 percent rise in 2014. More than this, Belarus still has a neo-Soviet economy, with few market-based stabilisers, indicating that this recession period may be indefinite. Although the figures portray a Belarus that is only recently in decline, the economic crisis has been building for a while. Belarus has had a new “technocratic” government since December 2014 and has not splurged or borrowed money, as might have been expected. The opposite, in fact. Monetary and fiscal policies have remained tight. Real interest rates are over 10 percent, but a liberalised exchange rate regime has allowed the Belarusian rouble to fall by half. The trade balance is in surplus for the first time in years, but real wages are down 3 percent and factories are even being allowed to lay off workers. Lukashenka met with IMF chief Christine Lagarde in New York in September about a possible support programme. Lukashenka has a long history of manufacturing fake exaggerated election majorities, but his baseline popularity has been remarkably stable since he first won 46 percent in a relatively free election in 1994. So his future is uncertain if he becomes a less generous batka. Furthermore, it is unclear whether he can rely on national security threats to maintain his popularity, if the social contract has to be curtailed. Big state factories with docile mass workforces dependent on Soviet-style welfare schemes attached to the workplace have also been a key instrument of social control in the past. The election itself was largely an exercise in political shadow-boxing, but even so, they showed how in domestic politics traditional patterns are being turned on their head. The traditional nationalist opposition has been disarmed by the security argument, and the potential threat from Russia has led most of the opposition to abandon the traditional model of mass protest after election fraud. In any case, ordinary Belarusians tend to see Ukraine’s “Maidan” as a threat to order rather than a path to liberty, with only 10 percent in support of public protests. Only around 100 turned up for a brief rally on election night. The only real opposition candidate in the election race was the relatively young female activist Tatsiana Karatkevich, endorsed by the “Tell the Truth!” campaign and a variety of other parties and NGOs. Her election slogan was “For Peaceful Change”. Many of the more radical opposition therefore grumbled that she had been given an easy ride as a soft opponent for Lukashenka – though it is hard to judge the effect of their boycott campaign when the official results are so clearly rigged (turnout was supposedly 87 per cent). On the one hand, Karatkevich’s candidacy was really a test-run to see if the opposition can emerge from the ghetto of cultural politics and foreign funding in which it has been trapped for at least ten years. On the other hand, there are few signs she can become leader of a united opposition. Her official vote was 4.4 percent (the IISEPS poll had her on 18 percent). The other two candidates were clearly pro-regime puppets. Siarhei Haidukevich is the Belarusian equivalent of Vladimir Zhirinovsky in Russia, a loud-mouthed populist whose real job is to attack the opposition, not the president. Haidukevich has performed this role at the three previous elections, though he withdrew from the 2010 vote late in the campaign. This year he had his own “shadow”, Mikalai Ulakhovich, a pale imitation from the “Patriotic Party”, with links to local Cossack groups and the Orthodox Church. Officially, Haidukevich won 3.3 percent and Ulakhovich 1.7 percent. Lukashenka released the six remaining political prisoners in Belarus on 22 August 2015, the day after the four election candidates were agreed. The EU has already suggested that some sanctions would be lifted, for an initial four months, as a result of this and the US may follow, but more slowly, as it has to be mindful of the 2004 Belarus Democracy Act. But both will have to think beyond sanctions and rethink their policy, as this is not the short-term manoeuvring seen before previous elections. Lukashenka’s problems will persist after the vote and Russian pressure won’t suddenly turn him into the West’s new best friend, making it clear that he needs to diversify his options. There were similar hopes of an “opening” for the West in Belarus before the last election in 2010. But the dynamic is different this time. In 2010 the EU at least saw hints of domestic liberalisation, and thought engagement would strengthen that trend. But Lukashenka’s reforms were only part of a balancing act to counter the pressure coming from Russia’s President Medvedev and Finance Minister Aleksei Kudrin at the time to extract better value for money from their relationship. Lukashenka soon made up with Putin instead and the West’s window of opportunity closed once more. This time Lukashenka has much more reason to be worried about Russia in the long-term. If the West chooses to help, it will be because we value Belarusian statehood and because Belarus has the potential to be a useful counterweight in a highly-troubled region, rather than because it is democratising at home. The latter, at least, may have to wait. Andrew Wilson is Professor of Ukrainian Studies at UCL SSEES and the author of Belarus: The Last European Dictatorship (Yale University Press, 2012).